Diablo III’s patch 2.4.1 is now live, with Season 6 starting on Friday, and that means a lot of new items to loot! 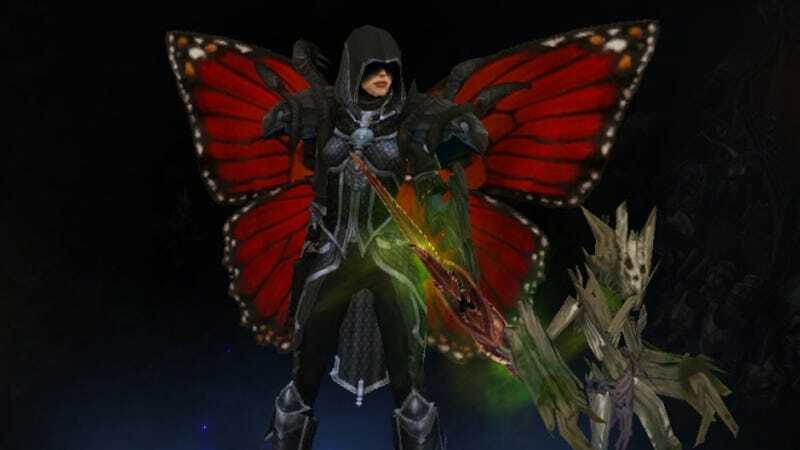 This time it’s all about cosmetic wings, pets and various transmog items. This post was originally published on March 10, 2016, and was updated to reflect the patch’s release. Cosmetics haven’t ever really benn a part of Diablo III. Players could get a few pets and wings as rewards for spending money on a collectors’ edition or on a Blizzcon ticket, and that was it. Patch 2.4.1 isn’t a huge one, compared to 2.4, but the amount of new wings, pets and other transmog items is remarkable. And they’re not that hard to find, as you can see here. All the new items basically drop from bosses, goblins and Mysterious Chests. The top one, for example, is a butterfly-looking wing, called Wings of Kokabiel, dropped by the uber version of Maghda. But here’s some more. Building a character with butterfly wings, a Starcraft Terran marine helmet and a Yeti pet will be absolutely possible. Hooray!